Rotary Club of the Hills-Kellyville President Fran Broadbent with Katie Geering. 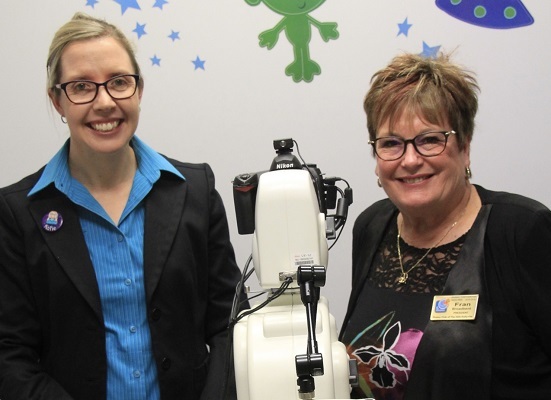 State of the art diagnostic eye imaging equipment has been presented to The Children’s Hospital at Westmead by members of The Rotary Club of Hills Kellyville. The SPECTRALIS OCT Diagnostic Eye Imaging equipment is now being used by pediatric ophthalmologists at what is the only dedicated eye treatment clinic for children in NSW. Katie Geering, co-head of the Ophthalmology department at the Westmead Children’s Hospital said the new equipment had recently been used on a four-year-old boy to give doctors valuable information about the cause for his vision loss and subsequent treatment. “His family were so thankful that we had this new piece of equipment at the hospital,“ she said. Rotarians and Rotary Districts around Australia and India supported the fundraising push by Hills Kellyville which became a Global Grant project of The Rotary Foundation of Rotary International.